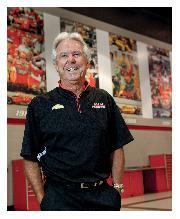 The omes were good for Rick Mears. The biggest race in the world it may have been, but he was never one to be overawed. In 1978, his first race at Indianapolis, he had started third on the grid, and the following year took pole and victory on his way to the inaugural CART championship. In 1981, he was champion again. 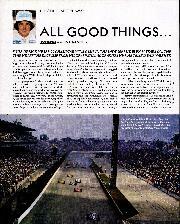 The reigning champ's tally of two wins from two pole positions in the opening rounds of 1982 also boded well. Penske's PC10 was a superb car which offered huge grip on corners, but was also easy on tyres, and so its handling remained consistent from pitstop to pitstop. Still, however good his car was, by the end of Indy's month-long qualifying, there was no doubting Mears' contribution to his pole position. A four-lap average of 207.004mph was almost 3mph up on his team-mate; Kevin Cogan. Behind the Penskes, Patrick Racing's Wildcats of Mario Andretti and Gordon Johncock lined up fourth and fifth, and were considered the strongest threat to Mean' ambitions, despite having struggled for a handling balance between light tanks and full. 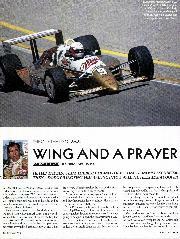 Still, both Wildcat drivers were experienced and hungry for success and it could be taken as read that third-placed man, A J Foyt, 21 years on from his first win here, would give his all in a March. A J very nearly went missing at the start though, when Cogan got sideways, tagged him, and then spun in front of Andretti, leaving Mario with nowhere to go. Mario was furious: a whole month of qualifying had been ruined by a moment's inattention from a fellow competitor. Scrub one Penske and one Wildcat But then, bearing in mind Gordon Smiley's horrific accident just a fortnight earlier, onlookers were just pleased everyone had stepped out without injury. If both Andretti and Foyt were frustrated, A J at least still had a car in which to express his emotions: at the restart, he took the lead and stayed there for almost 100 miles. Mean, predictably his nearest challenger, was not too bothered. "I still had something in hand. We didn't run away from everyone, but we didn't need to. That way we could save the tyres, the car, engines, whatever. 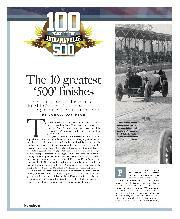 The PC10 was a very good race car, definitely the quickest on the track all day long." After the first fuel stops, Mean took the lead and then Johncock's Wildcat too, drove round Foyt As long as they stayed healthy, this looked like being a two-car race. 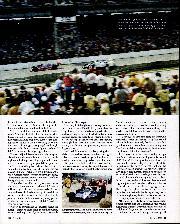 Al's bid for a fifth Indy victory descended into a morass of pit and car traumas that would lead to his retirement, while the Marches Tom Sneva and Pancho Carter would only be of a threat should similar troubles afflict the leaden. "We were just doing our normal deal," recalls Mean. "Working the first half of the race to get to the second half, tweaking the chassis and set-up at the pitstops, making sure it was right for the closing stages. Johncock and I were going back and forth with each other, just swapping places through pitstops, traffic. But whenever I got up to him, I didn't have any problems getting by him. "So we had just followed our normal game plan all day long, and towards the end of the race, heading for our final stop, two things happened. I dived into the pitroad, and caught up with Herm Johnson who'd come into the pits just ahead of me. He just stopped in the fast lane before he turned into his pit, and I hit him. Fortunately we didn't damage a wing, but it still meant I stopped and then got going, adding three or four seconds to the stop. That hurt the fight between Gordy and I. 'Then when I reached my pit, we stayed in too long and took on too much fuel; we didn't need a full load to get to the end, but we messed up in that stop, and basically filled the car up. So in addition to the extra time caused in the incident with Johnson, and in addition to sitting in my pit for another three or four seconds that I didn't need, we now had a heavy car. "Gordy, by contrast, had a good, clean in and out pitstop splash and he's gone. So on the pitstops, once everything's settled, I'm about 12 seconds down with 12 laps to go. "Well, my first thought was, `No way, we won't catch him', because I'm effectively gonna have to go qualifying. But we started running as hard as we could, and I kept an eye on the clock and saw I was catching Johncock a second a lap, getting closer and closer. I just kept bearing down and, sure enough, we caught him, between Turns Three and Four coming onto the front straightaway to get the white flag, one lap to go. 'As I said, I'd never had trouble passing Gordy all day. So when I had a nice run at him coming off of Four, I thought, 'Go ahead, get it done instead of waiting.' I mean, we only had one lap left to wait. "So I jumped outta the draft to his inside and my momentum carried me right alongside him, so that I actually had a nose on him at the start-finish line. And all of a sudden, he reversed that momentum and came back at me. Now he was either using some boost that he hadn't shown me all day, or it was because I still had a half a load of fuel and he was running empty. "Whatever, he had the nose going into Turn One so it was his corner, and! had to ease up, bob around in his turbulence. Obviously that lost me time, but I got the throttle down and cut the time. Going into Four, I was with him and pulled out, but it was too late, the start-finish line was there." So, having done the hard part, charging through from 12 seconds down, and setting a new lap record of 44.88sec (200.535mph), Rick had shown his hand, made his move a lap too early, and lost the biggest race in the world by 0.16sec hitherto, the Brickyard's closest finish. Mean has won four Indy 500s and set pole there six times. But, a pure racer, the way he lost the 1982 race bugs him to this day. 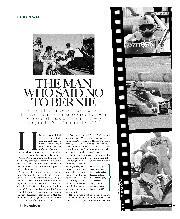 "Had I known what was going to take place, I would have waited until the run to the chequered flag, and just stayed close behind him on the last lap, made sure I got my distance right going into Three, to get the right amount of run on him coming out of Four. With the line being halfway down the front straightaway, by the time Gordon had the advantage again, it wouldn't have mattered. "That was '82," sighs Rick. 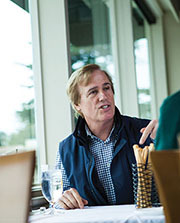 "I was quite inexperienced at that point, and Gordon had been around a long time. But after everything I had experienced with him all day, there just seemed no reason to it. "Still, the day you stop learning, it's time to go."